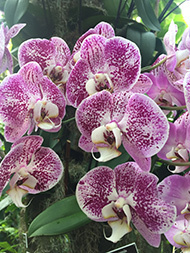 We took an enchanted trip to Singapore without a passport via the New York Botanical Garden for The Orchid Show: Singapore 2019, located inside the Enid A. Haupt Conservatory in Bronx, New York. 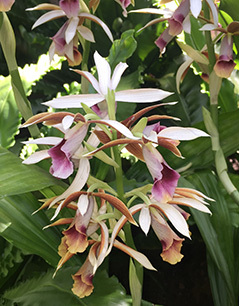 Every year from February until April, the New York Botanical Garden transforms the Enid A. Haupt Conservatory into a spectacular display of rare and exotic orchids, and for 2019, their theme is Singapore. 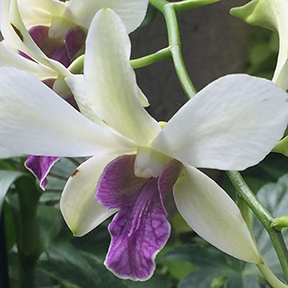 The Orchid Show: Singapore 2019 runs until April 28, 2019. 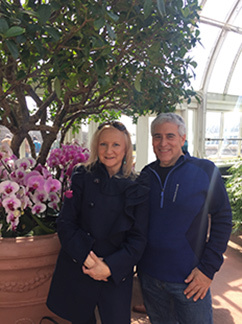 One of our annual highlights of Spring, is to attend The Orchid Show at the New York Botanical Garden's, where their expositions have taken us around the world via orchids. 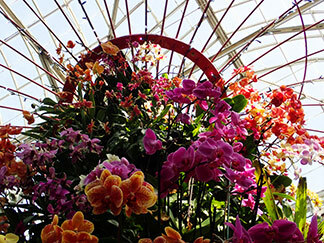 For 2019, their focus is Singapore, a country "renowned as a global center for orchid cultivation." 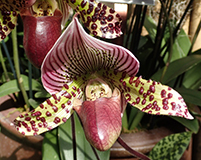 Every year, we see new and different orchids at the show as well as learn amazing facts; this year we learned that there are 30,000 species of orchids on six continents and that China has cultivated orchids for 2,500 years. 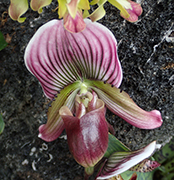 Interesting to note is that orchids come in all sizes from microscopic flowers to those having plate size flowers. 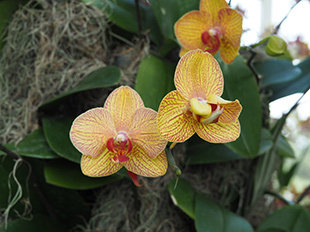 Some orchids grow on stems that barely reach 6 inches while others can grow on stems up to 25 feet long. 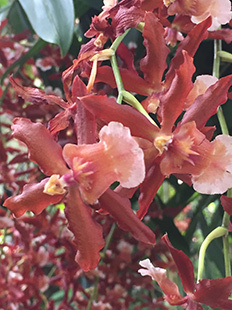 Many tropical orchids are tree dwellers Epiphytes, which attach themselves to trees or plants. Unlike parasitic plants, they do not harm the trees or plants, rather their specialized roots allow them to attach themselves to the tree's bark and absorb nutrients and rain water. 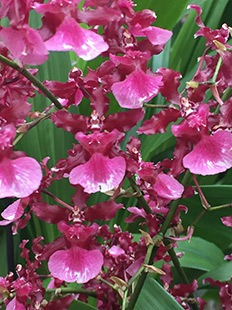 Most Dancing Lady Orchids Oncidium are Epiphytes. They were introduced to Europe from the Americas in the 1830s and earned their name Dancing Lady from their ruffled petals that resemble ladies' skirts. 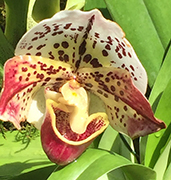 Aside from the distinctively shaped petals, another way to tell Dancing Lady Orchids is by their color, which is usually yellow or brown. 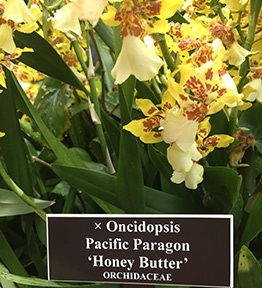 Among the many orchids that we saw at the show were Moth Orchids Phalaenopsis, which have "moth or butterfly shaped flowers. 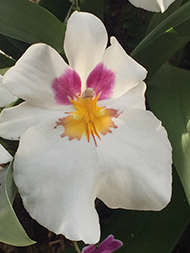 Their striped, mottled, or spotted petals provide inspiration for hybridizers." 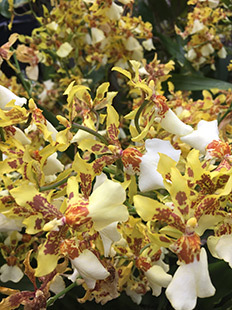 There was a new hybrid Vanda Orchid, Awkwafina, at the show this year, which the "NYBG named in honor of the actress Awkwafina, native New Yorker and star of Crazy Rich Asians (2018), a film which spotlights Singapore. 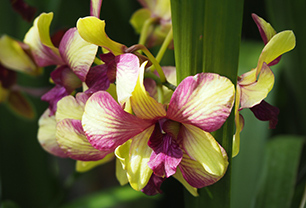 Vanda Orchids are abundant in Singapore and come in a rainbow of color. The Vanda Awkwafinais a gorgeous deep raspberry color. 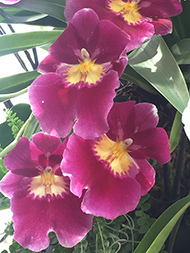 Always a favorite are the Pansy Orchids Miltoniopsis whose "faces", and colors look like pansies, and grow in high altitude cloud forests that extend from Central to South America. 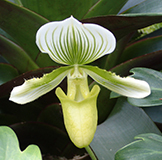 Another favorite is the Slipper Orchid Paphiopedilum of which there are 60 species and grow in tropical Asia to Southern India and New Guinea. They come in a wide range of colors and can be striped, spotted, or have wart-like bumps. 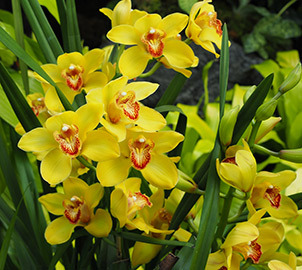 A way to identify the Asian Corsage Orchid Cymbidium is by its "grass-like leaves and tall spikes of large, waxy flowers." 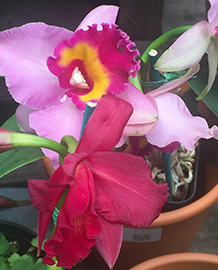 This type of orchid grows plentifully in Asia and is a favorite for cut-flowers. 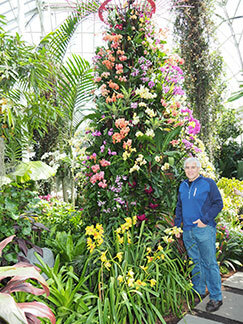 Every year, The Orchid Show at the New York Botanical Gardens enchants, delights, and surprises us with its spectacular displays of natural beauty, and this year was another spectacular year of discovery. 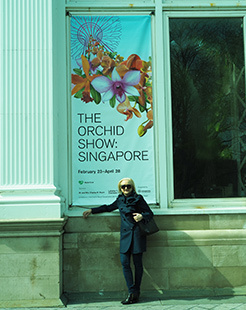 Do rush to see The Orchid Show: Singapore 2019 before it closed on April 28, 2019. 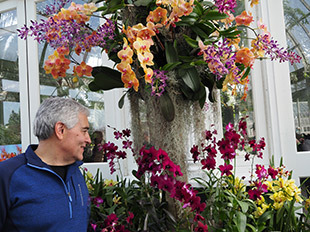 The New York Botanical Garden is a 250-acre oasis located in Bronx, New York. Founded in 1891, the garden attracts year-round visitors with its exquisite beauty, spectacular exhibitions, and interesting programs. 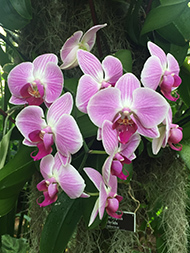 There are many interesting programs held during The Orchid Show, which include Orchid Evenings, Orchid Show Tours, Orchid Care Demonstrations, Orchid Care Expert Q & A, and Roaming Guides, so be sure to check their website to plan your visit. 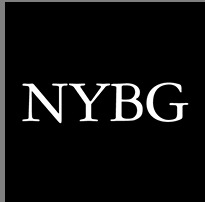 The New York Botanical Garden (NYBG) is a National Historic Landmark located in Bronx, New York where its nearby neighbors include Fordham University and the Bronx. Weekday Tickets: Adult: $23, Student (with valid ID) and Senior (65+): $20, Children 2-12: $10, Children Under 2: Free, Members Free. Note: Ticket prices are subject to change depending on season and current exhibition. Weekend Tickets: Adult: $28, Student (with valid ID) and Senior (65+): $25,Children 2-12: $12, Children Under 2: Free, Members: Free. Note: Ticket prices are subject to change depending on season and current exhibition. AAA members receive $2 off full-price adult All-Garden Pass tickets on weekends and $4 on weekdays. Members must provide valid AAA card. Offer available on-site only. Not valid during the Holiday Train Show®. Hours: The Garden is open year-round and select holiday Mondays. Tuesday through Sunday: Hours are typically 10:00 am until 6:00 pm. Winter Hours for mid-January and February are 10:00 am until 5:00 pm. 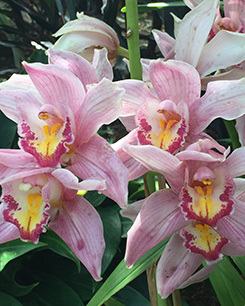 Visiting New York City and want to visit the New York Botanical Garden? TheGarden is easily accessible via a 20-minute train ride from Grand Central Terminal in Manhattan on the Metro-North Harlem local line to Botanical Garden Stop and is also accessible by Subway and by bus. Visit their website for directions and additional information. There is paid visitor parking for those arriving by car. Follow Luxury Experience on Facebook at www.facebook.com/LuxuryExperienceto see more photos and watch video clips. © April 2019. Luxury Experience. www.LuxuryExperience.com All rights reserved.